The holiday season is upon us and with that, a constant barrage from retailers attempting to get us to spend money. A refreshing break from this materialistic inundation is Giving Tuesday—it’s one day when charities everywhere join forces to raise money, awareness and volunteerism. Giving Tuesday falls annually on the Tuesday after Thanksgiving. Started in 2012 and endorsed by the UN Foundation and the Bill and Melinda Gates Foundation, #GivingTuesday was designed to be a social-first holiday. Consumers have already been trained to go buy at the malls on Black Friday, support local businesses on Small Business Saturday and find amazing online deals on Cyber Monday. Given this existing post-Thanksgiving shopping cadence, it proved easy for Americans to quickly embrace Giving Tuesday as a part of the holiday spending spree season. You may think that people have exhausted all their funds by the time Giving Tuesday rolls around, but the data says otherwise. In fact, last year approximately $300,000,000.00 was raised for charity on this day. As Giving Tuesday continues gaining traction on social media, we expect even more to be raised in 2018. We wanted to spotlight a few unique campaigns for the holiday that may be of interest to you. Check them out and be sure to give! It may feel incredibly paralyzing to try to help communities impacted by war on the other side of the world. However, there’s an unbelievably simple way to promote peace in war zones—help the community’s children go to school! You can cut a community’s risk of conflict in half, simply by doubling secondary school enrollment from 30% to 60%. Justice Rising is radically committed to supporting education in war zone communities. 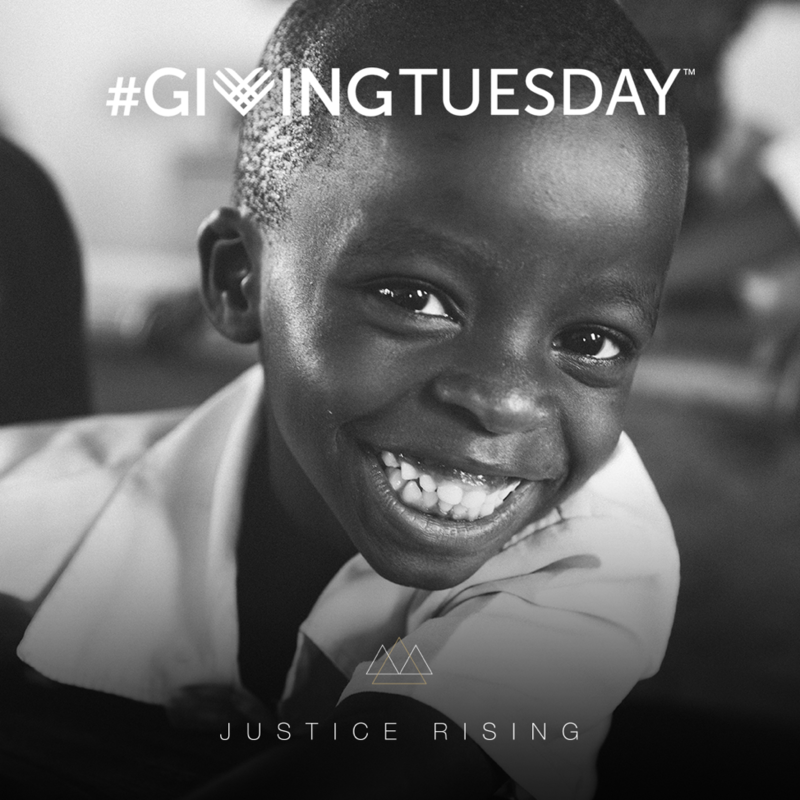 Working in Eastern Congo, Iraq and Syria, Justice Rising supports education for over 1,800 students in ten schools. On Giving Tuesday, they aim to raise $20,000 to support the construction of 40 new schools. If you’d like to like to join their efforts, donate here! This Giving Tuesday campaign hinges on the power of YouTube. YouTube continues its rapid growth as the preferred platform for watching custom content, especially among young viewers. In fact, YouTube is currently the number two search engine in the world (second only to Google). Influencers carry increasing clout in effecting culture and impacting how viewers spend their money. As this online video community matures, influencers are realizing that they have an obligation to give back in authentic ways and the power to fundraise large amounts. That’s why we love the donation platform that Fullscreen developed in partnership with Pledgeling for YouTube creators. Last year approximately $300 million was raised for charity! Some of the biggest names in YouTube are posting videos to galvanize their fans to donate to ten of the most reputable charities out there. This campaign is working to support some of Lightworker’s favorite organizations including charity: water and Make-a-Wish. If you want to join forces with your favorite YouTuber creator and donate to an amazing cause, check out this campaign at www.fullscreen.gives. Ever seen a Facebook post from a friend asking for donations? It’s a shockingly simple tool that’s been effective to raise over $1 billion for charity since its inception just three years ago. This year, Facebook has committed to match the first $7 million raised via its fundraiser widget. If you have a cause that you’re passionate about, virtually every non-profit accepts donations through the tool. Set up your fundraiser here and then share it to your community. People love making donations when they know their funds will be matched!